A nourishing, soothing cream formula that softens the beard to ensure a close shave and protects skin from razor burn and irritation. It provides a protective cushion between the skin and razor, for a close shave without redness or irritation. Antiseptic tea tree oil and witch hazel diminish razor burn, while marine elements replenish lost moisture. Peppermint, menthol, and botanical extracts refresh and soothe skin. Early days but really loving this! I bought it because I've bought other BoC products which I've been impressed with, but wasn't really expecting much difference to other shave formulas I've used before. But from the first shave I've felt a noticeable difference - a smooth shave and a great finish! Each to their own of course, but this really works for me. 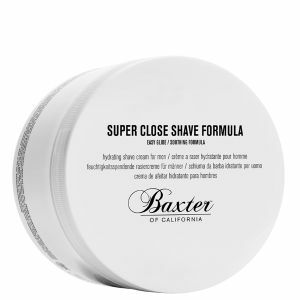 I must say that Super Close Shave Formula 240ml was a total let down, it just will not lather. The best I have ever used I have wet shaved all my life nothing better. I think this product provides great value for money. I have used many shaving creams from the cheap to the ridiculously expensive and this is by far the best I have come across. You don't need to use much, especially if you use a shaving brush and you get a really smooth clean shave. I would definitely recommend this product 10/10! I just switched from shaving foam to this cream and man-u brush. I am surprised that this does not make good leather... not sure if its due to the hard water in the South or its usual with this cream. The 15ml man-u cream came with the brush is just better- but no where close to the foam. Did I miss something here?